Relocating groups of employees has major implications for organisational success. Mobility professionals must seek to address cultural differences, thereby boosting engagement with employees. The implications of relocating groups of employees and their families have become very high profile over the past year, particularly as organisations take stock of the implications of Brexit for their UK operations.Alongside international group moves, considerable media attention has been paid to the relocation of businesses within the UK. Group moves can prove to be especially disruptive to productivity as employees face uncertainty over their future and prepare to move themselves and their families to another part of the country or the world.Group-move exercises can involve bringing together different organisations as a result of mergers, acquisitions and joint ventures. Various research studies have shown that over half of such business developments are considered to be failures; they simply do not realise their expected shareholder value.Problems include clashes between the cultures of the organisations themselves or societal cultures, legislative differences (such as the legal implications of harmonising contracts and pensions issues), and keeping people motivated during the set-up and immediately after the venture.Specifically, key problem areas for mobility and human resources professionals include little post-transaction involvement compared with pre-merger/acquisition/joint venture activity. For example, much attention is paid to the necessary pre-move mobility preparations and communications. Less focus is generally given to the post-move integration consequences of working in a new cultural environment.Research shows that people issues, especially training and development, are generally not handled well. Better relationships with senior management, the line and advisers are needed, such that input from mobility and HR can be incorporated into the post-move business development strategy and its implementation. As Relocate’s factsheets on managing across cultures demonstrate, new ventures such as mergers and acquisitions will have different organisational cultures from those of the businesses that were previously operating independently. If the group move also involves international mobility, employees will have to contend with a different societal culture, too.These factors can jeopardise the success of group-move employee engagement if they are not addressed.Cultures comprise unseen and rarely articulated assumptions which make them unique. These assumptions drive values, which may be expressed in an organisational context but are usually not verbalised in societal terms. Yet it is these assumptions and values that shape behaviours. Without an understanding of them, how people react to situations, and the decisions that they take with regard to what is deemed acceptable or not, can appear bewildering.Relocated employees working in teams with people from different organisational and societal cultures following a group move can easily misunderstand social cues. If they attempt to manage their subordinates – or work with colleagues in their new teams – in ways that are deemed to be inappropriate, working relationships will be damaged. This will have detrimental effects on motivation, commitment, productivity and engagement across the business.The relevance of understanding factors that can support and develop engagement is thus of immense importance to mobility professionals, who would not wish to see their successful efforts to relocate groups of staff undone as a result of post-relocation cultural misunderstandings. As Relocate’s factsheet series on group moves shows, a number of factors are considered to affect employee engagement.Senior management must demonstrate integrity – walk the talk. Group moves frequently involve the relocation of senior management. After a merger, acquisition or joint venture, where two or more organisations come together, senior management from each party involved must be seen to act in a coordinated, supportive and culturally sensitive manner in developing the organisation’s new shared values.It is important for global mobility professionals and group-move specialists to remember that these individuals will have their own cultural baggage, bringing with them the organisational and societal cultures from their previous experiences. Cultural briefings and training can make a big difference to the success of senior management on relocation by encouraging them to use appropriate behaviours to bring about organisational change.Engaging line managers also plays a major part in fostering employee engagement. These managers are required to encourage dialogue and communication, and to provide supportive work environments. Once again, line management may have been relocated as part of the group move to join forces with locally based line managers as part of the new entity.As with the relocation of senior management, preparation and training in the effects of cultural differences, with a special focus on management, negotiations and team building, will prove crucial to successful line management integration.Further drivers of employee engagement include a good match between the individual and the job they do, with appropriate resources in place. Global mobility professionals have a key role to play here within talent management strategy. It is crucial that the relocation of individuals as part of a group move exercise links to appropriate job roles in the new business venture. Robust talent selection processes are necessary to ensure that employees are matched to the new positions correctly.Despite the turbulence that often accompanies a relocation exercise, attention must be paid to ensuring that resources are in place. Employee engagement is also linked to meaningful work, and thus job content needs to provide this form of intrinsic motivation.While these points might seem rather obvious, they are frequently overlooked. For example, global mobility professionals are well aware of repatriation shortfalls, such as employees returning home after a sojourn abroad to find that no one has thought to provide a role that makes good use of the competencies they have developed abroad (that is, there is no meaningful work) or even forgetting to provide office space, a desk or a phone (that is, no resources).Turnover can then lead to a loss of valuable skills. These oversights cannot be allowed to damage employee engagement during a group move. Disaffected employees spread discontent to others, damaging the engagement climate.Job demands can also affect employee engagement. Mergers, acquisitions and joint ventures are times of uncertainty when organisational members have to work especially intensely to maintain outputs and productivity, especially during the period of post-launch integration.High workloads, tight deadlines and role ambiguity can all lead to stress, poor work-life balance and even burnout. Group moves involve families as well as employees. Spill over of work demands into family life can damage family relationships. Family problems, in turn, affect employees’ work focus.All these factors have negative effects on employee engagement, and steps must be taken to mitigate them. As Relocate’s factsheet series examining group moves and managing across cultures explains, global mobility professionals must work closely with senior management and the line to ensure that group-move policy implementation supports senior management vision, enables employee voice, and maintains effective relationships between line managers and employees.Close working relationships with HR and Talent are also required to address job–person fit, meaningful work and job-resources issues. If engagement is to be maintained, communication and dialogue are required post-move, not just pre-move, to ensure continuity.Research demonstrates that one of the key problems undermining the success of mergers, acquisitions and joint ventures relates to lack of post-integration training. International relocation policy typically makes provision for cultural training.Generally, this is designed to support individuals – and sometimes family members – to gain cultural awareness of the country to which they will relocate. It is usually delivered pre-assignment. In the case of group moves taking place internationally, such training is still appropriate, but it needs to be extended. This is where significant value can be added. Post-move cultural clashes can seriously derail business functioning through loss of employee engagement. Misunderstandings and inappropriate behaviours result from the interactions of the receiving employee group and the relocated group. These can flow from lack of organisational and societal cultural awareness.Training will therefore be beneficial if it addresses not only national cultures but also the values that senior management wishes to foster in the new organisational culture. It should apply to both receiving and relocating staff, and should be delivered not only before but also after the integration period.Global mobility professionals who champion such initiatives will play a major part in the development and maintenance of group-move engagement and positive business outcomes. 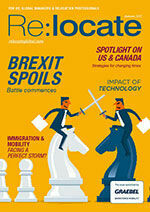 Read more about how global mobility professionals can ensure successful relocation in the Autumn 2017 issue of Relocate magazine. Get access to our free Global Mobility Toolkit © 2017. This article first appeared in the Autumn 2017 edition of Relocate magazine, published by Profile Locations, Spray Hill, Hastings Road, Lamberhurst, Kent TN3 8JB. All rights reserved. This publication (or any part thereof) may not be reproduced in any form without the prior written permission of Profile Locations. Profile Locations accepts no liability for the accuracy of the contents or any opinions expressed herein.